The ACT Acorn project, an international research project which involves University geology experts, has announced the findings of its research into the feasibility of establishing a carbon capture and storage facility in the North Sea. Carbon capture and storage (CCS) involves capturing carbon dioxide (CO2) emissions, transporting it and securely storing it in rock formations under the sea, where the geology is suitable. The University provided expertise in geology and rock deformation to the ACT Acorn project to check whether the sandstone and caprock at two potential storage sites in the North Sea were suitable for the injection and long-term storage of CO2. The team analysed multiple sandstone and caprock samples using highly specialist equipment which is unique to the University’s Rock Deformation and Diagenesis Laboratories. Samples were tested for their porosity, permeability, mineral content and their strength under pressure. 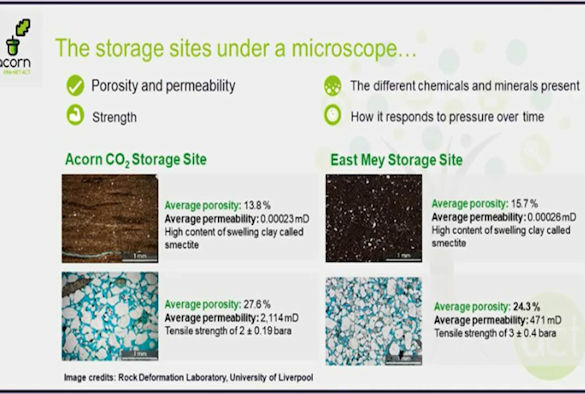 Liverpool Geologist, Professor Richard Worden, presented the results of his geochemical, mineralogical, petrological analysis of the sandstone and caprock, and the results of tests to measure the rocks’ strength under pressure at an event in London. He said: “We were able to use specialist high-pressure deformation apparatus in our Rock Deformation Laboratory to test the geology and strength of the sandstone and caprock and to replicate the conditions experienced down at the reservoir depth. “We found that at both potential storage sites the sandstone and caprock had the right levels of porosity and permeability necessary for the injection and long term storage of CO2. 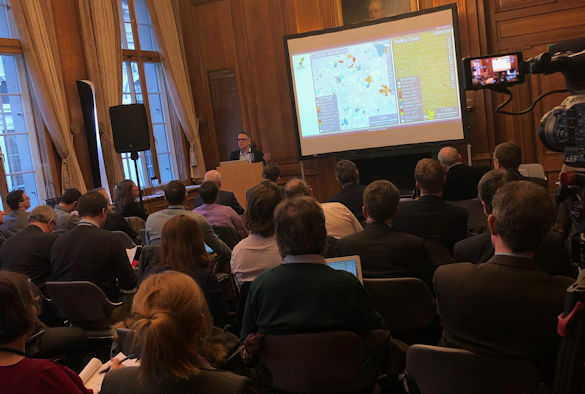 The key findings from the ACT Acorn project confirmed that the UK’s existing North Sea oil and gas transport infrastructure, coupled with an impressive natural CO2 geological storage resource, offers significant benefits and value. It ultimately ranked the North Sea’s East May and Captain Sandstone formations as the top storage sites, selected out of 16 possible sites. The ACT Acorn project involved eight partners from the UK, Norway and the Netherlands and is led by Pale Blue Dot Energy. Other partners include Scottish Carbon Capture & Storage (University of Aberdeen, University of Edinburgh and Heriot-Watt University), Bellona (Norway) and Radboud University (Netherlands). The ACT Acorn was funded by the European Commission’s ERA-NET ACT programme.